Dear Food Tech Campus Member! We are happy that you decided to become a member of Food Tech Campus! You will be part of a network of real foodies, makers and EDEKA decision makers. 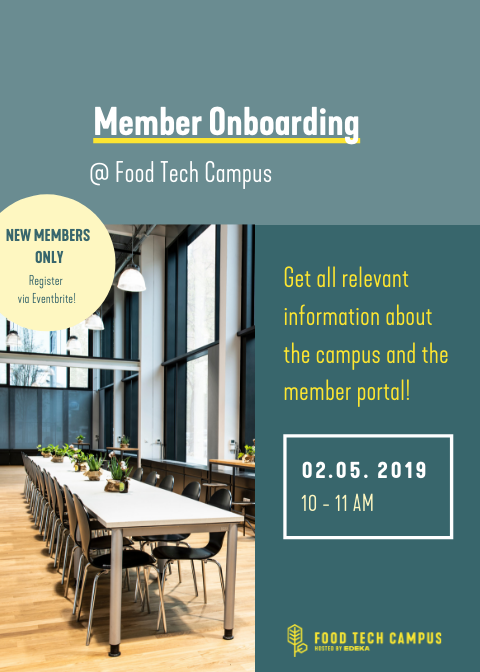 The Member Onboarding gives you an introduction to the Food Tech Campus and allows you to get to know the campus team and other members. We’ll explain general information about the space, where and how you can work with us and how to find your way around the member portal. You will also receive your access card. Then you can decide whether you want to book a meeting room first or the Media Kitchen! Registration takes place via the Eventbritelink deposited in the member portal.